SUBMITTED AN ARTICLE to Homiletic & Pastoral Review, which is a wonderful publication, but it was rejected. Let me explain what happened. I’ve been published in HPR in the past. About two years ago, I started considering submitting another article, and after a few months, I finally found the time to sit down and write it. Then, I had to wait for it to be proofread. Then, I finally found the time to place it in the mail (summer 2012). Their organization recently changed editors, and they lost my submission. I sent it again. Finally, on 20 November 2012, they said they enjoyed the article but decided not to print it. The priest who rejected it was very professional, polite, and encouraging. I’m beginning to wonder if I should continue to write articles. Has anyone had a similar experience? Feel free to share your thoughts in the combox. REMEMBER: I’m not saying HPR should have printed my article. They probably get hundreds of wonderful submissions. I’m merely relating what happened. I BEGAN TO PONDER ARTICLES. What is an article? Is it only to be published when it contains newly-discovered information? It seems to me that certain successful authors publish the same ideas over and over. In a certain sense, we live in a very strange age. We are taught never to use the personal pronoun “I” when writing articles. We are told we must project the image of an omniscient, objective, modern “scholar,” and personal pronouns detract from this. How ironic, since ours is the same age that denies the existence of absolute Truth! In graduate school, we had to attend numerous conferences and symposia where papers were presented by musicologists who could barely play a C Major scale. We listened to presentations on the great choral works of history from theorists who could not even sing in tune. One time, a professor marked an error on my paper because I had pointed out an interesting fact about a certain composition. His red pen wrote, “Let your readers decide if that is interesting.” I’m sure he wanted me to congratulate him on how “objective” he was. By the way, I just committed a sin by writing, “His red pen wrote.” Another one of my professors would have asked me, “Did HE write, or did his PEN write?” Enough. You get the point. If only our modern day “know-it-all” professors would take the time to look back into former decades, they would see that musicologists and theorists who actually knew their stuff did indeed use the personal pronoun “I” throughout their works. They were not at all embarrassed to say things like, “I have not found any mediaeval source containing such-and-such.” They were quite comfortable in their own knowledge as well as the fact that they were not infallible. We need more scholars like them! The worst is when I see an article by somebody touted as “one of the leading experts on the Catholic liturgy.” I’ve pretty much “seen it all” in this regard. I’ve seen articles published about the liturgy by “scholars” who are comfortable preaching heresy. I’ve seen articles on the liturgy by Bishops who don’t even say Mass each day (according to people who work for them). I’ve seen articles on the liturgy published by “priest scholars” who don’t even say their office each day and allow every manner of terrible music at their Masses. In fact, only those who have suffered can understand the liturgy. And only those who understand the liturgy ought to publish articles about it. At the liturgy, we come face-to-face with God. Imagine! And we can pray to Him, telling Him all our troubles, worries, and woes. In some ways, the Canon and the Propers are the most moving parts of Mass. You might ask, “Why the Propers? Why not the Readings.” The answer is the same reason which accounts for the popularity of Blogs. Blogs are popular because the entries are not too long, and we have short attention spans. The same with the Propers: they pick out the perfect little “nuggets” to carefully reflect on. Where else can we go and enter into anything of such antiquity? Many of these prayers go back untold ages. All of a sudden, images confront one. Emperor Heraclius, Thomas Aquinas, Pope Hadrian, Saint Augustine, and a thousand others. Especially during the Roman Canon, when the names of so many ancient saints are recounted. Especially when the Canon is read with love and care, as in this audio excerpt by Most Rev. Bishop Gracida. Especially in the quiet solitude of one’s soul. Some people think that the mere fact of owning a lot of old books with copious footnotes makes one a scholar. I promise you, it doesn’t. 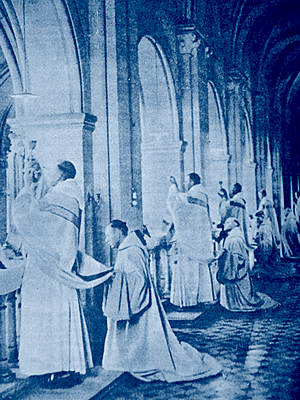 Only those who live the liturgy ought to write and speak about it. Books are books. People are people. God is God. Life is not the internet. Life is not fancy footnotes. Life is being in communion with God, and the liturgy allows us to do this.